Mitral regurgitation is a condition where the mitral valve leaflets do not close tightly. When this happens, blood flows backward from the heart's left ventricle into the left atrium, making the heart work harder to push blood through the body. There are two types of mitral regurgitation: degenerative and functional. Degenerative mitral regurgitation, also called primary mitral regurgitation, is caused by damage to the mitral valve leaflets. Functional mitral regurgitation, also called secondary mitral regurgitation, is caused by enlargement of the heart due to heart attack or heart failure. The ventricle becomes enlarged and doesn’t contract like normal, which causes the leaflets of the valve not to meet in the center. If left untreated, mitral regurgitation can cause lots of stress on the heart, recurrent episodes of heart failure, severe shortness of breath, swelling of the legs, frequent hospital stays, and ultimately leads to death. Repairing the leak may change the course of the disease and increase a patient’s overall quality of life. Mitral valve regurgitation treatment depends on how severe your condition is, if you're experiencing signs and symptoms, and if your condition is getting worse. The goal of treatment is to improve your heart's function while minimizing your signs and symptoms and avoiding future complications. Medications can decrease symptoms and reduce secondary or functional mitral regurgitation, but no medications can treat primary or degenerative regurgitation. 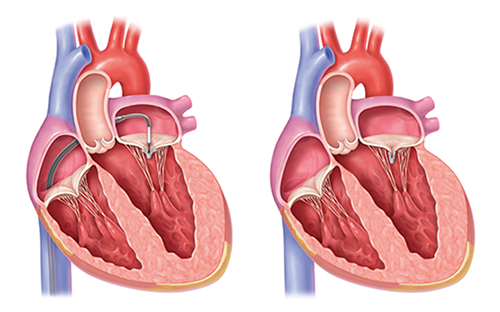 Surgeons can repair the valve by reconnecting valve flaps (leaflets), replacing the cords that support the valve, or removing excess valve tissue so that the leaflets can close tightly. Surgeons may often tighten or reinforce the ring around a valve (annulus) by implanting an artificial ring (annuloplasty band). 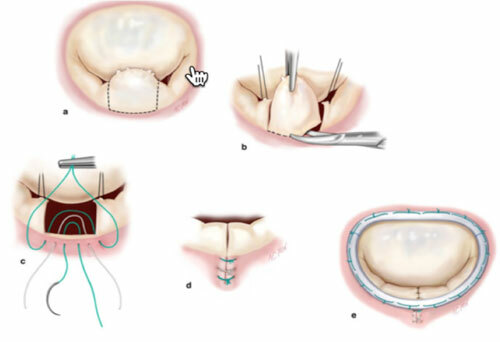 If your mitral valve can't be repaired, you may need mitral valve replacement. In mitral valve replacement, your surgeon removes the damaged valve and replaces it with a mechanical valve or a valve made from cow, pig or human heart tissue (biological tissue valve). If you have been diagnosed as having mitral regurgitation, you should consult with a cardiologist, who can advise you of your options. Fortunately, there are more options for patients with this disease than ever before.